Talde is the namesake restaurant of Chef Dale Talde—the first restaurant to solidify a lasting partnership with restaurateurs David Massoni and John Bush. The first location debuted in Brooklyn in 2012, with Jersey City following in 2014, and Miami in late 2015. Here, the menu features creative Asian-American cuisine that has been playfully dubbed “in-authentically Asian,” with a beverage menu of East-meets- West spirits, featuring seasonally-inspired cocktails. Signature dishes include Pretzel Pork and Chive Dumplings; Crispy Oyster-Bacon Pad Thai; and Korean Fried Chicken with Spicy Kimchi Yogurt, Grapes and Mint. Located on the ground floor of Hotel 50 Bowery, Rice & Gold features Asian American fare. The menu also takes cues from cuisines around the globe, showcasing the diversity and vibrancy of our modern day country and the many immigrants who have settled here and now call America home. Evident are influences from China and the Philippines, as well as Mexico, Bangladesh, Iran, Jamaica, India and more. The restaurant, from Chef Dale Talde and the Three Kings Restaurant Group, serves breakfast, lunch, brunch and dinner. 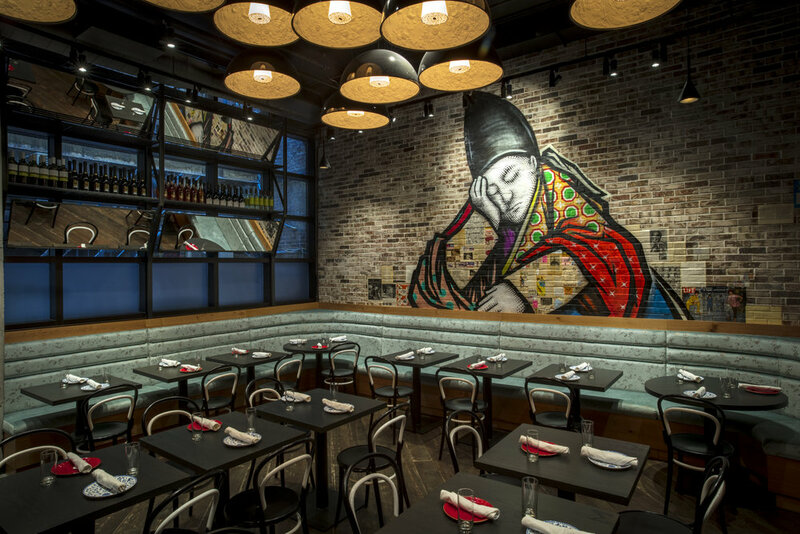 The space features an 11-seat bar and a 180-seat dining room, as well as a custom graffiti art installation designed by local artist, Mr. Ewok One. The restaurant also features a robust bar program, including cocktails, wine, beer and sake. Chef Dale Talde and his partners, David Massoni and John Bush, all of Three Kings Restaurant Group, make their first foray into Manhattan with three unique concepts inside the Arlo Nomad Hotel: Massoni, a full-service restaurant that serves “Inauthentic Italian” fare; BARlo, the 2nd floor bar and adjoining terrace; and The Heights, a seasonal rooftop bar and patio. At Massoni, diners have the option of breakfast, lunch or dinner, and are able to sample Chef Dale Talde’s “Inauthentic Italian” cuisine, featuring classic Italian dishes with multi-cultural flavors and ingredients. Think Arancini Balls but with biyrani-style rice, served with cool ranch raita and spicy tomato; and Malfalde with uni, serrano and smoked onion dashi. The cocktail program at Massoni is rooted in the classic cocktails of New York City. Like the food, the influence of Italian - American culinary traditions and flavors find their way into updated classics. The drinks take their names from the last stops of the different subway lines that run throughout the city. Massoni also offers an entirely Italian-focused wine program, consisting of about 15 white and 20-25 red. The offerings span all of Italy, including both traditional and more offbeat options, as well as several to choose from some of the smaller vineyards. On the beer front, both Italian and craft domestic brews are available. Grandview Public Market is a culinary experience located within the newly developed Warehouse District in West Palm Beach. Grandview Public is comprised of 14 individual vendors providing unique experiences in shopping and casual dining. Located on the 21st floor of Hotel 50 Bowery sits The Crown, a rooftop bar & lounge from Chef Dale Talde, David Massoni, and John Bush of Three Kings Restaurant Group. Commanding some of the only sweeping views of downtown Manhattan, Brooklyn, and even the far off silhouettes of Queens and New Jersey, from Chinatown, The Crown offers guests two different outdoor terraces and multiple vantage points to take it all in. A variety of Asian-inspired cocktails and a small menu of rotating globally-inspired small bites complement the expansive views, while the large copper-accented indoor lounge offers respite from the sun and weather. The Crown is truly a unique addition to the Chinatown neighborhood, and is inspired by its rich history. The Heights is a rooftop bar, located at the top of the Arlo NoMad Hotel, from the Three Kings Restaurant Group. With expansive views of the city, including the best view in Manhattan of the Empire State Building. The Heights offers guests the ideal place to grab a drink, hang out with friends, enjoy a slice of pizza, and take it all in.